Are you Utilising Microsoft Planner? For anyone who is an avid to-do list keeper, Microsoft Planner is your new best friend. This tool is a project-management tool, similar to Trello, also a free project tool. With Microsoft Planner, businesses, schools and organisations can structure teamwork easily, where teams can create new plans, organise, assign and collaborate on tasks, set due dates, update statuses and share files. Planner also includes visual dashboards and email notifications to help keep everyone informed on progress. 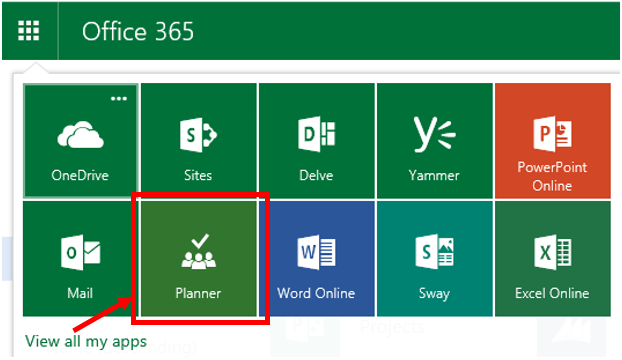 All users with eligible subscription plans will automatically see the Planner tile appear in the Office 365 app launcher. No specific action by Office 365 admins is needed. Planner is available for Office 365 Enterprise E1 – E5, Business Essentials, Premium and Education plans. Each plan you work on has its own board, where you can organise tasks into buckets, then categorise tasks based on their status or who they are assigned to. You can also create cards for your tasks, place them in different buckets and tag them with numerous colours. Cards can have checklists, comments, attachments, links, start and end dates. Event planners can have buckets allocated for ‘in advance, ‘on the day’ and ‘after the event’. This tool allows you to attach files to tasks, work together on those files, and even have conversations around tasks without switching between applications. Planner works across all devices and allows everyone to be on the same page. Utilising the Chart feature allows all team members to track and visualise their current progress in the ‘hub’. Yellow signifies task not yet started, Red for late tasks, Blue for in progress and green for completed. The ‘Hub’ allows you to track overall progress, see who’s on time and who’s behind and also track your own progress on tasks and assignments. 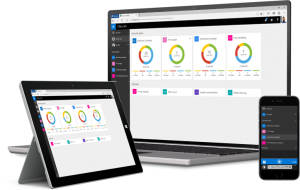 Microsoft’s planner is integrated across all Microsoft products – something that is extremely useful for customers already utilising Microsoft’s Office Suite. For example, Planner is integrated with Office 365 Groups, allowing conversations in Planner to be available in Outlook 2016, Outlook on the web, and the Groups Mobile Apps. OneNote is also fully integrated – every plan has a OneNote Notebook created and users can utilise Office – allowing team members to attach Word, Excel and PowerPoint files to a card. This in its entirety is then stored in the SharePoint Online document library, with offline capabilities.